French-Cuban twins Ibeyi will release their hotly anticipated self-titled debut for XL Recordings on February 17, and as the duo reveal in a recent Exclaim! interview, it was overwhelmingly a family affair. Their mother (and manager) contributed vocals, helped write, took the album's cover photo, and "took us to choir" when the duo were young; their uncle wrote the lyrics to "Behind the Curtain"; and their late father, Anga Díaz, a famed Cuban percussionist and member of the Buena Vista Social Club who died when they were 11, ended up influencing them to connect with him spiritually through music. "I think it was unconscious," says Naomi, the more rhythm- and production-inclined of the sisters, but she ascribes her decision to play the cajón, a rhythm instrument found all over Ibeyi, as "a way to connect with [her late father]. I'm pretty sure if he still would be here, I wouldn't play cajón." Asked about their curious teenage years — spent listening to their parents' music as much as their own and revelling in their parents' culture, rather than pushing against them, as most teens do — Lisa-Kaindé, the more songwriter-oriented of the duo, is frank. "People are always asking us, 'How come you like the music that your parents like? Usually when you're a teenager you don't like the music that your parents like.' But our parents were so cool! It was impossible to not like the music that they liked!" And while Naomi's more modern taste in music — she likes Kendrick Lamar, hip-hop and electronic — occasionally clashes with Lisa-Kaindé's, who prefers classic soul and jazz, the two were able to synthesize the music of their parents with their own distinct tastes to create something new and fresh. "We miss the studio! It was an amazing time," Lisa-Kaindé says. "The studio was one of the most amazing experiences of our lives, actually." It was there that XL head Richard Russell helped guide them through the process. "When I started writing this album I was maybe 14, 15," explains Lisa-Kaindé. "There's some songs that are really old and some songs that are really young, and when we went into the studio, I thought I was not able to compose a song for our elder sister ["Yanira"] and our father [the subject of "Think of You"], but actually, Richard gave me the confidence to write those songs." Naomi adds that Russell acted as a balancing presence for them. "We fight a lot, but it's true that in the studio, we never fought," maintains Naomi. "There was some 'I think it's better to do this, I think it's better to do that,' and we were talking, but with Richard, too. He was like a mediator." Lisa-Kaindé agrees: "I think the good thing about our relationship is we are really different, we have different tastes in music. That's why our music is like that — it's a mix of two people! I definitely think confronting our [different] ideas was a good thing for this album." "And it will be the same for the second," Naomi interjects. "She wants to do more weird stuff, and I want to do more hip-hop stuff, so we need to" — together, as if on cue — "compromise." 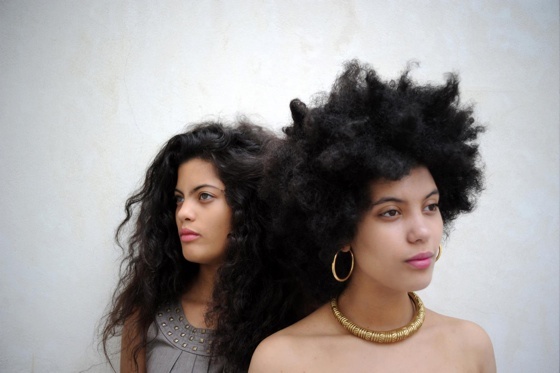 See Ibeyi's tour dates below. They include Canadian stops in Toronto, Montreal and Vancouver.